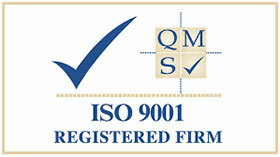 All optical elements within Resolve Optics radiation resistant lens designs are made using cerium oxide doped glass or synthetic silica enabling them to withstand radiation doses of up to 100,000,000 rads and temperatures up to 55°C without discoloration or degradation of performance. All Resolve Optics radiation resistant lenses provide high image resolution and minimum geometric distortion from 400 to 750nm. While Resolve Optics has extensive experience of supplying fixed focus and zoom radiation resistant lenses for applications in Nuclear reprocessing and power generation – today our expertise is helping organisations operating in a growing number of different and interesting applications. In medical research – Resolve Optics radiation resistant lenses form targeting elements in synchrotron radiation therapy machines and also in commercial x-ray instrumentation. In outer space all instrumentation, sensors and cameras are subject to constant bombardment by radiation that will quickly degrade and make inoperative standard optical components. Space borne applications present a challenging environment, subject to radiation, where camera lens servicing or replacement is highly undesirable. Recently NASA selected Resolve Optics to supply them with a selection of high performance, radiation resistant zoom lenses because of their expertise in this area and willingness to work on adapting standard 3x and 6x non- browning zoom lens designs to be ‘space ready’. 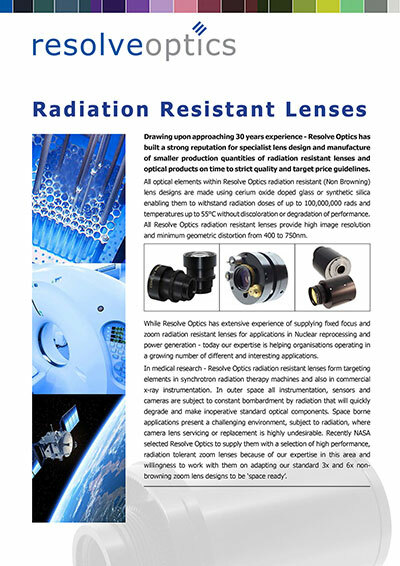 For a copy of the new brochure please visit www.resolveoptics.com/radiation-resistant-lenses-2/ or contact Resolve Optics Ltd. on +44-1494-777100 / sales@resolveoptics.com.